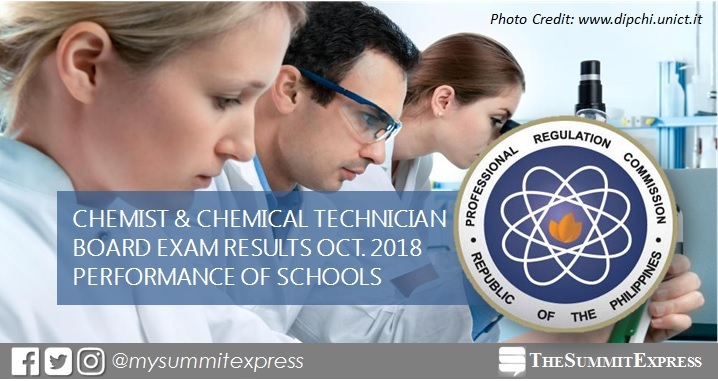 MANILA, Philippines – The Professional Regulation Commission (PRC) hailed the top performing schools in the October 2018 Chemist and Chemical Technician board exam. Results were released online on Monday, October 15, 2018 or in two (2) working days after the exam. PRC conducted the Chemist licensure exam on October 9 and 10 and Chemical Technician board exam on October 11, 2018 in the cities of Manila, Cagayan de Oro and Cebu. In the October 2017 Chemist board exams, University of the Philippines (UP)- Diliman topped the schools with 87.93% (51 out of 58 passed the exams). It was followed by UP-Los Banos with 86.67% (52 out of 60 passed). Meanwhile, Mindanao State University (MSU) - Iligan Institute of Technology aced the Chemical Technician board exam with 89.29% (50 out of 56 passed). In the October 2016 Chemist exams, UPD and UPLB also dominated the schools with 95% and 87.72%, respectively. Monitor this page for the real-time updates on Chemist and Chemical Technician board exam results. Check out also the official website of PRC for more information.